I love risotto. I remember being so intimidated by it when I first learned to cook. Having to stand in front of a stove stirring constantly for 30 minutes just seemed like too much of an opportunity for my ADD to screw it up but I eventually gave it shot and it really wasn’t as bad as people made it out to be. The key is maintaining a constant temp (not too high, not too low) and stirring relatively regularly while it absorbs the liquid (but not constantly). I’ve made a lot of different risottos over the years and most of them were drowning in parmesan reggiano, mascarpone or pecorino in addition to whatever other deliciousness (pancetta! butternut squash! fried sage!) I put in there. I wanted to make it a little less of an indulgence and more of a regular day meal so I made a few tweaks to the traditional recipes I’ve made. 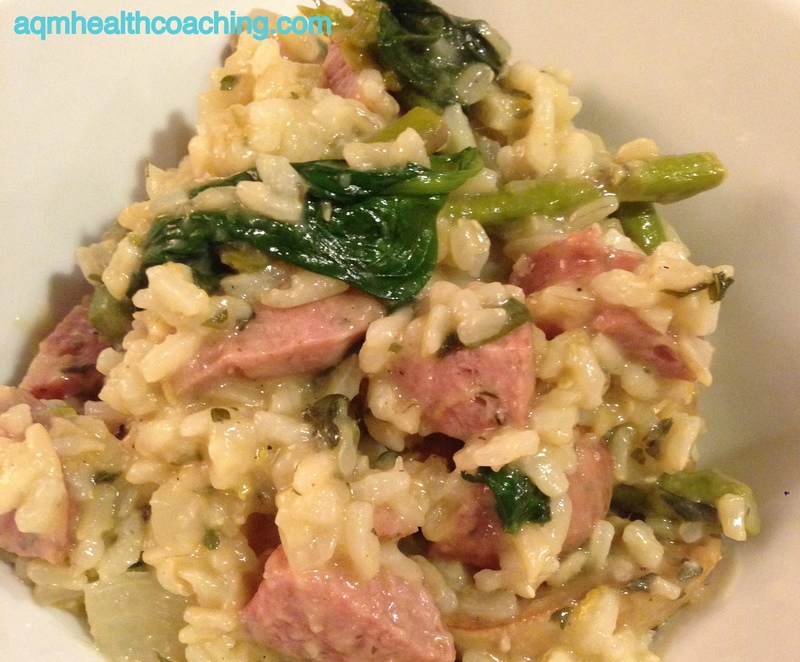 This one has no cheese, I’ve swapped out some of the arborio rice for brown rice, and I’ve included a couple servings of veggies but make no doubt about it – this is still a delicious and indulgent tasting dish! Risotto is usually made with a high starch rice like Arborio, because the starch content lends itself to creaminess when cooked slowly with liquid. But the problem with most rice that is right for risotto is that they are stripped of the whole grain (otherwise making risotto would take hours!) and when you eat them they can spike your blood sugar just like white rice. No bueno. To counter that (a little), I decided to use 1/2 arborio and 1/2 brown rice for this batch. It makes a difference! Note about substitutions: This can easily be made vegan by opting for vegetable broth in place of the chicken broth and using coconut oil or olive oil in place of the butter (though I would opt for extra virgin olive oil for the 2 tbsp of butter stirred in at the end – more flavor!). This can also easily be alcohol free. The wine is just for flavor. You can omit it and add in a little extra lemon juice at the end or a dash of your favorite vinegar to brighten the flavor. 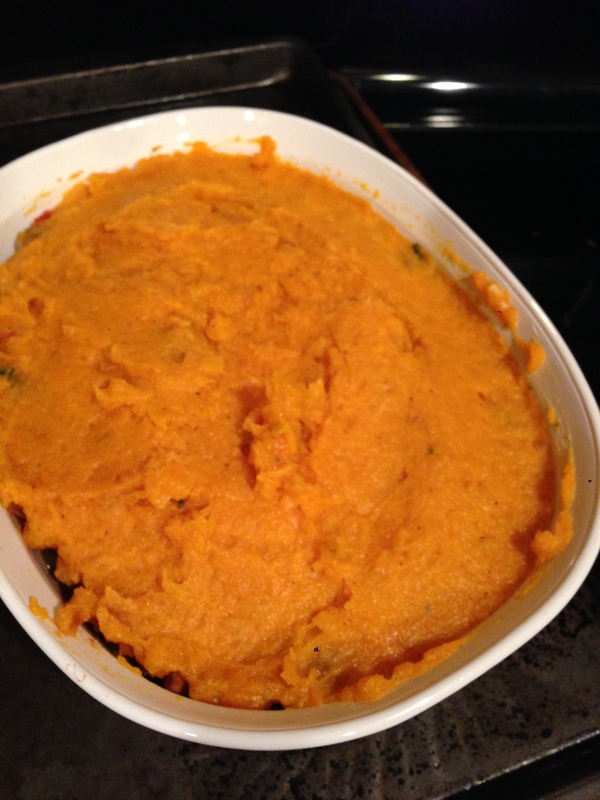 This makes 6 side dish servings or 4 main course servings (though I would add protein to serve this as a main dish). dried or fresh parsley – your call as to how much (I love it so I use a lot!). You’ll need 3 sauce pans or dutch ovens for this recipe. I honestly believe (now) that risotto isn’t that complicated but I do recommend reading through the entire recipe before starting so that you have an idea of what is coming next while you are cooking. Pour the chicken stock into a saucepan and turn heat to medium-low. In another saucepan or dutch oven, begin cooking your brown or wild rice according to the package directions (or if you’re me, just pour a few cups of water in a pan, boil and add rice). You will only cook the whole grain rice for half it’s normal cooking time (so if it requires 45 minutes to cook, you will cook it for 22-23 minutes. When you’ve cooked the wild rice for the allotted time, drain if necessary. In another saucepan, (while the whole grain rice cooks), melt 1 tbsp butter and 1 tbsp olive oil over medium heat. When the pan is hot, add the onion and cook for 5 minutes or until it softens. 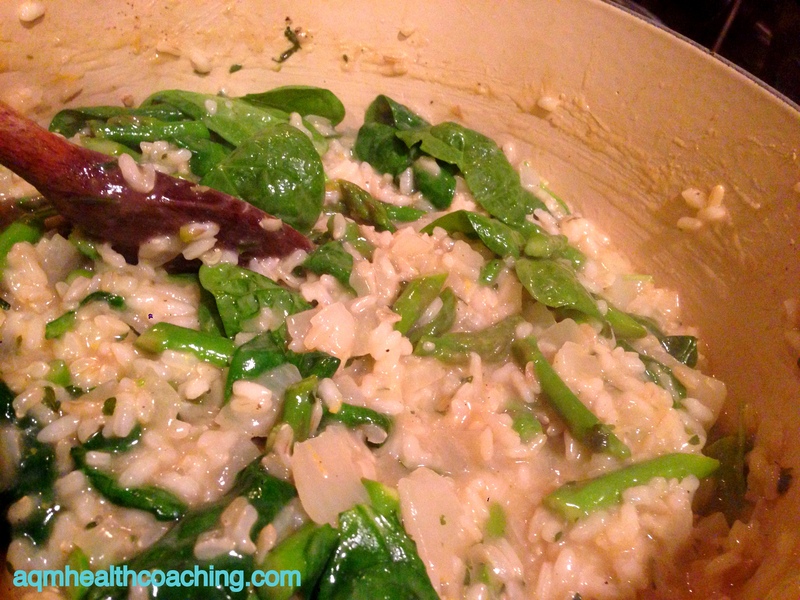 Add the arborio rice and stir well to coat the rice with the pan liquids. When it’s well coated add the wine to the pan. Stir and let it cook until it’s mostly absorbed. 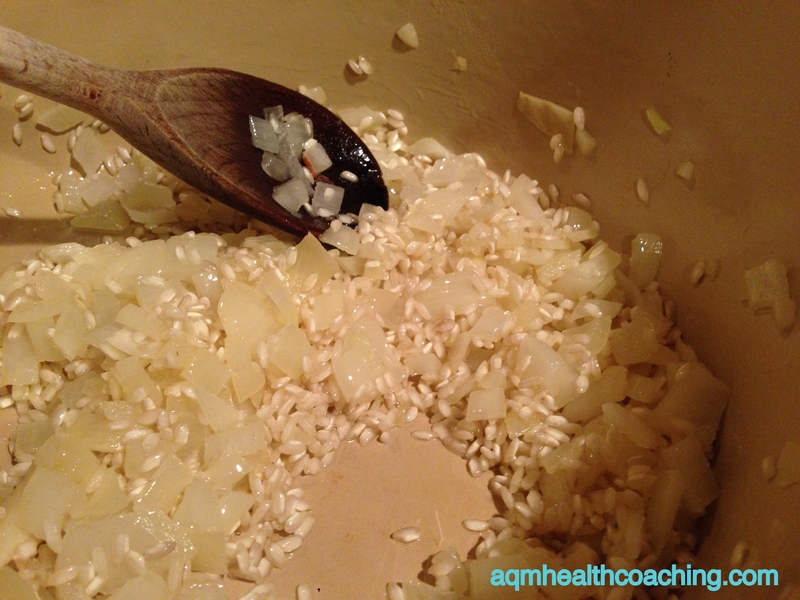 Once the wine is mostly absorbed, add a small ladle of hot stock to the rice and stir. It should be absorbed into the rice in about 2 minutes. Continue adding small ladles full of stock to the rice, one at a time, stirring occasionally and allowing it to completely absorb into the rice before adding another. Do this until the stock is gone (20 – 25 minutes). Note: You may have to turn your heat up or down a little to make the liquid absorb at the right speed. Add in the whole grain rice when it’s cooked at it’s halfway mark – usually after the first couple of ladles of stock have been added to the risotto so that the arborio and whole grain rice finish cooking together. Coating the arborio rice with pan liquids. When you are on your last ladle or two of chicken stock, add in the asparagus and allow it to “cook” with the rice. One the liquid is absorbed, turn the heat down, add in your lemon juice, lemon zest, baby spinach, parsley, salt and black pepper. Stir until the spinach wilts and then stir in the remaining 2 tbsps of butter. 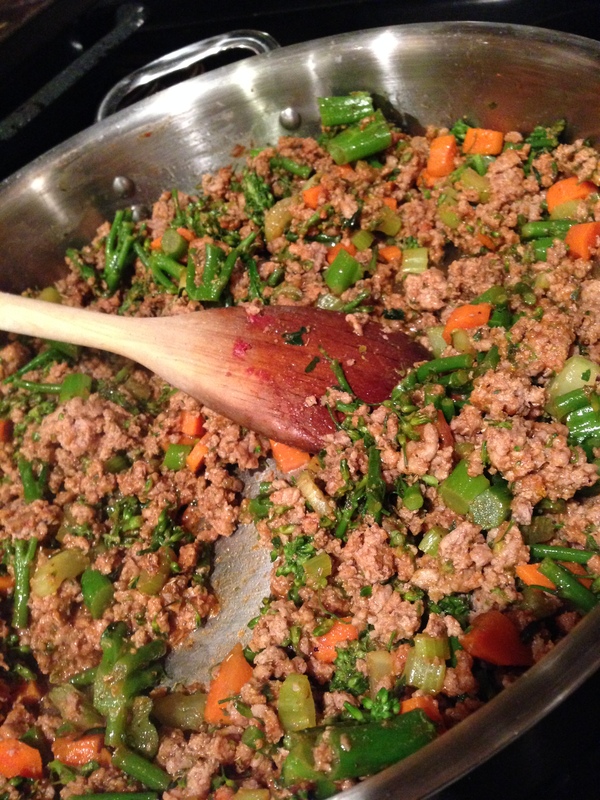 Taste to adjust seasoning if needed and serve! This is a great base for risotto – meaning you can change this really easily by adding herbs, or by swapping out the vegetables for different ones. 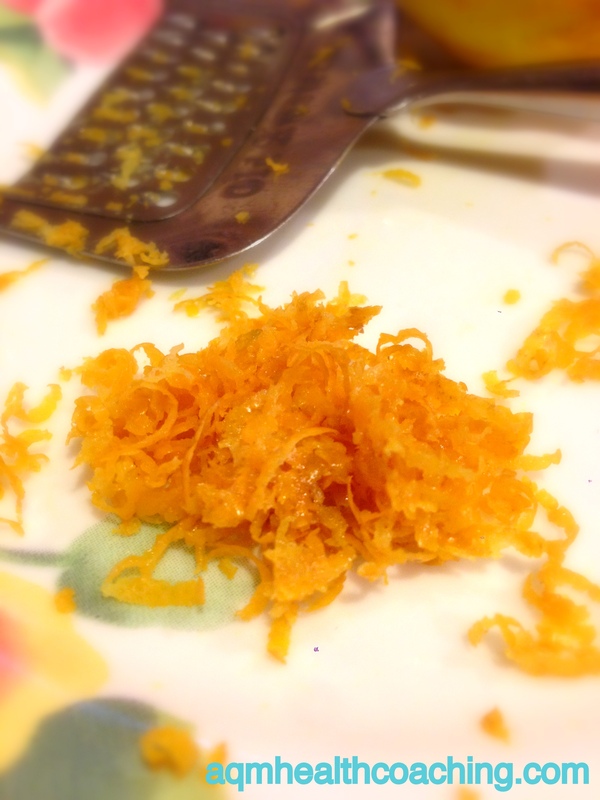 You can skip lemon juice & zest and see if you like a less tangy flavor! So many options. Enjoy! Wilting the spinach at the end of cooking. I like to add sliced smoked sausage or pan seared wild sea scallops to mine. Yum! 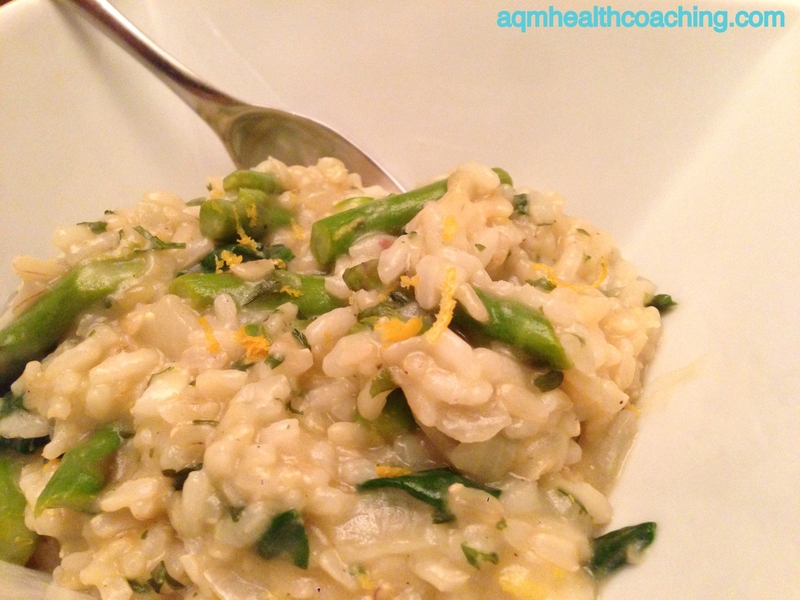 This entry was posted in Gluten Free, Recipes and tagged cheese free, entrees, gluten free, lemon risotto, risotto, side dishes, whole grain risotto on October 26, 2014 by Andrea Quigley Maynard. 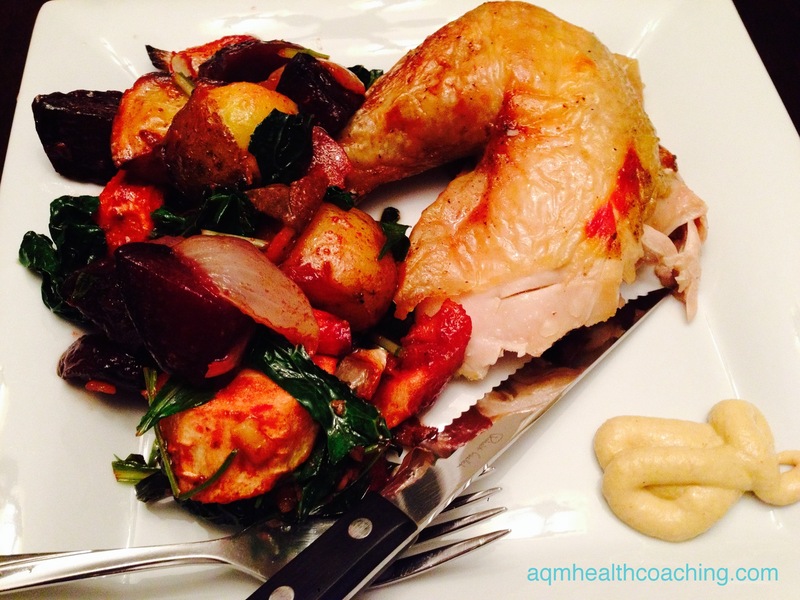 The Benefits of Eating Fermented Foods & Invitation to Free Video Conference! Friday night I put on a workshop on “Eating for Energy & Vitality” as part of NSH Lady Project’s first Active Night at the Strength in Balance Studio in Nashua. It was really fun and a great way to network, get some exercise and teach others a little about what I’ve learned about the connection between food, lifestyle and our energy levels. The women had a lot of questions for me and one of the things that they were interested in learning about was fermented foods. It’s something that seems to be coming up a lot lately in the media so I thought I should spend a little time on it in this week’s email in case you had questions about it too. I’m not going to go heavily into detail but I want you to know what fermented foods are, what the benefits of eating them are and how to get them into your diet. Consider this the “cliff notes” version on fermented foods – it’s a huge subject and I’m only going to glaze the surface here! But before we get into fermented foods, I want to invite you to something I’m doing next week. If you are interested in learning about how you can live and eat for better energy, I’m holding a live google hangout call on October 29th at 7pm EST. It will be a web version of the talk I did Friday night. You can join it by viewing it directly at this link on October 29th or you can sign up here to receive email reminders of the video chat and receive an email link to the recording after the fact (in case you miss it live!). Come check it out! Barring any technical glitches, I promise it will be very informative – we’ll talk about why women are struggling with their energy levels, why that is important and ultimately what we can do about it! Good stuff! Refrigeration and freezing food is a relatively new thing in terms of human’s ability to preserve and store foods. Long before we had electricity or ice boxes, people had to find ways to make food last longer to get them through months of the year where food was scarce (think winter!). One method of preserving food was through fermentation. In fermentation, the carbohydrates in fruits and vegetables are converted into lactic acid (which is a natural preservative), by a rich bacteria that naturally lives on them. In the right controlled conditions (such as temperature, moisture and lack of exposure to oxygen), this bacteria will multiply and grow. As the bacteria multiplies, it continues to feed on the starch in the food, which preserves the food but also breaks it down some, making it easier for us to digest. One side benefit to fermenting foods was that people noticed it completely changed the taste of some foods, in many cases the chemical changes happening actually completely transformed the taste and texture of the food that was preserved (like as in the case of beer or wine). Why should we eat them? Did you know that there is more bacterial cells in our bodies than actual human cells? I know, that’s disgusting to think about. Most of the bacteria that makes it’s home in our bodies is beneficial to us and plays a large role in proper digestion and in keeping our immune systems strong. Lifestyle factors can affect whether we have a lot of good bacteria or too much bad bacteria in our guts. The good bacteria can be damaged or even wiped out by poor diets, the use of antibiotics and from exposure to glyphosate (a pesticide sprayed on gmo crops). Without a healthy amount of good bacteria in our gut, bad bacteria can run rampant, and is often made worse by our diets, like those high in sugar (the bad stuff feeds off of sugar). This can lead to skin problems like eczema, acne or psoriasis , digestive issues (constipation, diarrhea, gas – you name it! ), and increased frequency of colds and allergies. Adding fermented foods to your diet can replace good bacteria that has been wiped out by these lifestyle factors. Healing our gut issues is a complicated subject (far bigger than I can address in an email) and requires dedication but regularly eating fermented foods is a start! They are easy to digest and will increase the amount of good bacteria living in your gut. A few of the fermented foods in my fridge. How and where can I find them? You can make them yourself – which a couple of google searches will direct you to. Or you can buy them at many grocery stores today. There is a whole range of fermented food available today. Sauerkraut, pickles, kvass, miso paste, tempeh, natto, kefir, raw dairy, kimchi, sourdough bread are just a few that you might be able to find in your local store. Most fermented foods will be in the refrigerated section of the store as they are living foods and the bacteria count can be affected by improper storage. In choosing fermented foods at the store, the ingredient list is important. Most will have very few ingredients on the label (in the case of naturally fermented sauerkraut, water, cabbage and salt is usually all!). When you start seeing preservatives and words you don’t recognize, it is likely not a true fermented product. One other way of knowing if you have a high quality product is that naturally fermented foods are usually unpasteurized. Some people have safety concerns about eating food that has not been pasteurized and it’s a valid one. I think it is a personal decision and an especially careful one for those who are pregnant, elderly or have compromised immune systems. My feelings on it, is that while pasteurization kills harmful bacteria, it also kills beneficial bacteria (so your pasteurized yogurt probably doesn’t have nearly as much acidophilus that you think it does) and humans ate food for centuries long before pasteurization even existed. Honestly, there is just as much risk of sickness from bacteria from eating raw vegetables (remember all those e. coli scares from tomatoes and spinach a few years back?) than there is from eating naturally fermented foods but we never question if salad is safe. Again, it’s a personal choice and I urge you to do your own research. If you do choose to eat fermented, unpasteurized foods, the quality you choose matters, especially important when choosing raw animal foods, such as in the case of raw dairy. Know your farmer and their practices. Anyone who is running safe practices is going to be more than willing to give you a tour of the facilities. Well, that’s a lot to digest (digest! get it? haha!)! 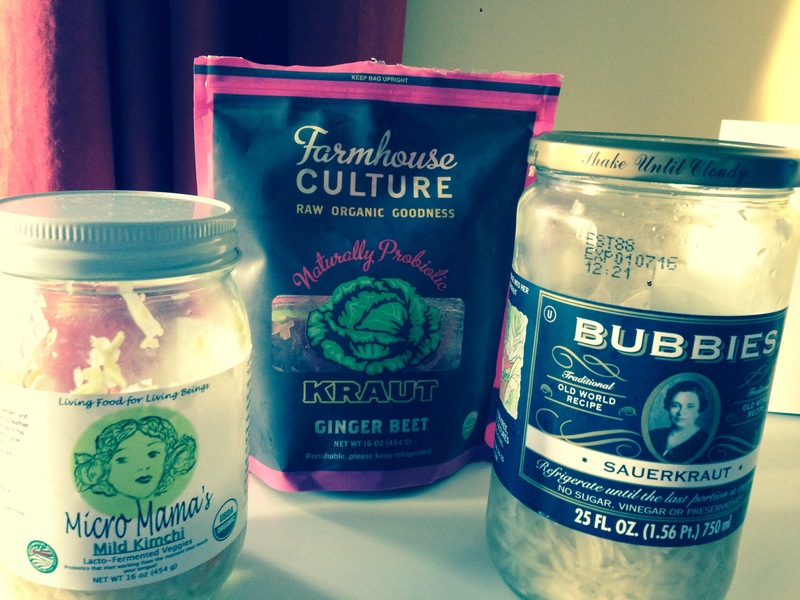 If you have any questions about fermented foods, feel free to send them my way! I’m happy to discuss anything that I believe can lead to happier and healthier lives for all of us! Wishing you happy gut flora and hope to see you join us on Oct 29th to learn about eating for energy! This was originally posted as an email newsletter. To sign up for this list, click here! 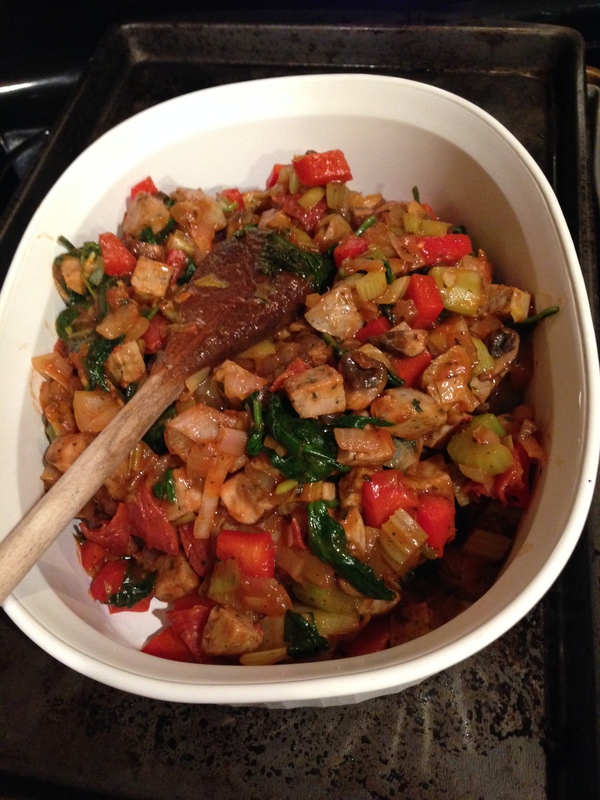 This entry was posted in Events, Healthy Tips and tagged bubbies, events, farmhouse culture, fermented foods, good digestion, google hangouts, gut flora, probiotics, Speaking Events on October 21, 2014 by Andrea Quigley Maynard. 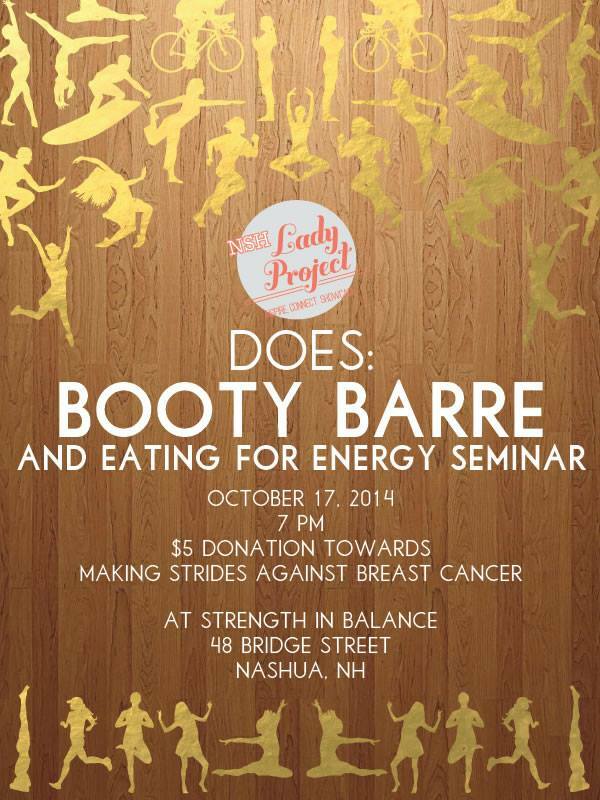 Next Friday, October 17th, 2014, the NSH Lady Project is hosting their first Active night at Strength in Balance. The event starts at 7pm. For just $5 (all of which is being donated to Making Strides Against Breast Cancer, Nashua), you’ll get to mingle with some new ladies you haven’t met before, take an introductory Booty Barre class with Becki Somers and you’ll get to hear me talk! I’ll be teaching a class on Eating for Energy & Vitality (something many of us could use some help with). I’m so excited about it! We’ll talk about some of the most common culprits that sap our energy throughout the day, natural ways you can boost your energy and some of the best foods for keeping energy levels strong. I’ll also be sending folks home with some delicious recipes they can make themselves. 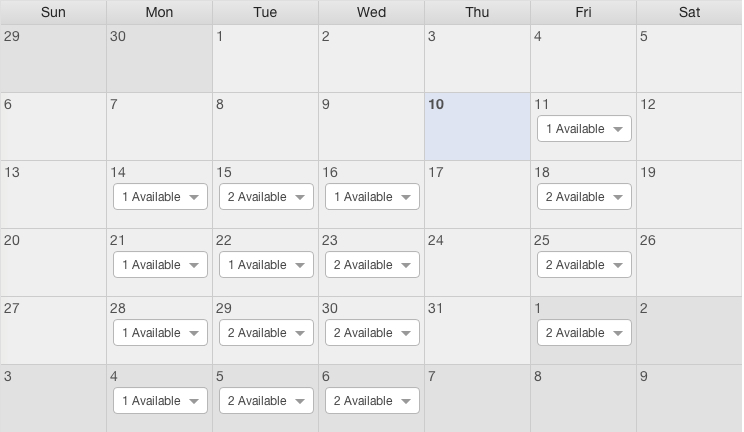 Those of you who follow me on facebook or read my blog regularly know that I’m a huge fan of the classes at Strength in Balance – I’ve been going to classes there at least 4 days a week for almost a whole year now. It’s an amazing workout and Becki is a great instructor. This event really is a great chance for you to try it! It’s challenging but also a lot of fun! You can purchase your ticket here. Hurry though, space is limited (due to the size of the studio)! See you Friday October 17! This entry was posted in Events, Exercise, Local and tagged Booty Barre, Eating for Energy & Vitality, Making Strides Against Breast Cancer, Networking Events, NSH Lady Project, Speaking Events, Strength in Balance NH on October 10, 2014 by Andrea Quigley Maynard. 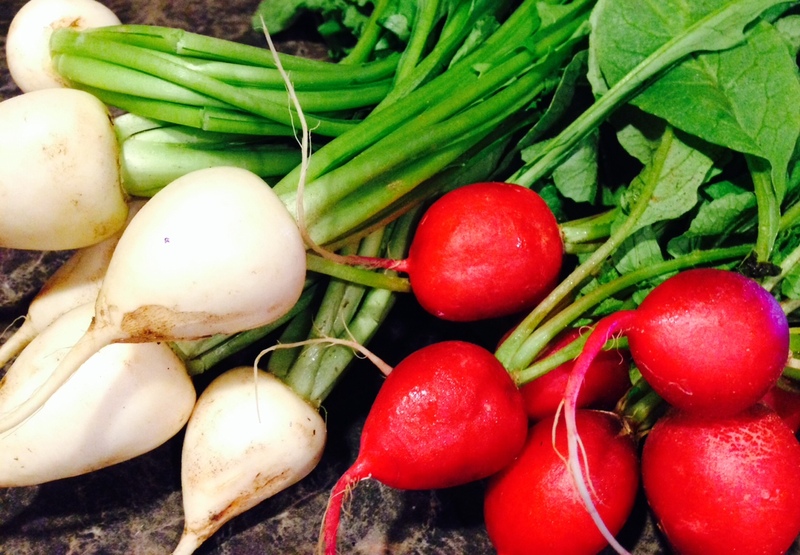 Are you a fan of radishes and their greens? They’re a great source of vitamin C, folate and potassium and they contain several phytochemicals and antioxidants that help keep our liver, kidneys and bladder running smoothly. Most people eat them raw in salads so they probably aren’t eating enough of them to get much nutritional benefit from them but eating them cooked is a great way to take in more in one sitting (they’re a little spicy otherwise, don’t you think?). I actually prefer to eat them cooked because it completely changes the flavor! They become a whole new vegetable, I promise! Here’s my favorite way to prepare them. 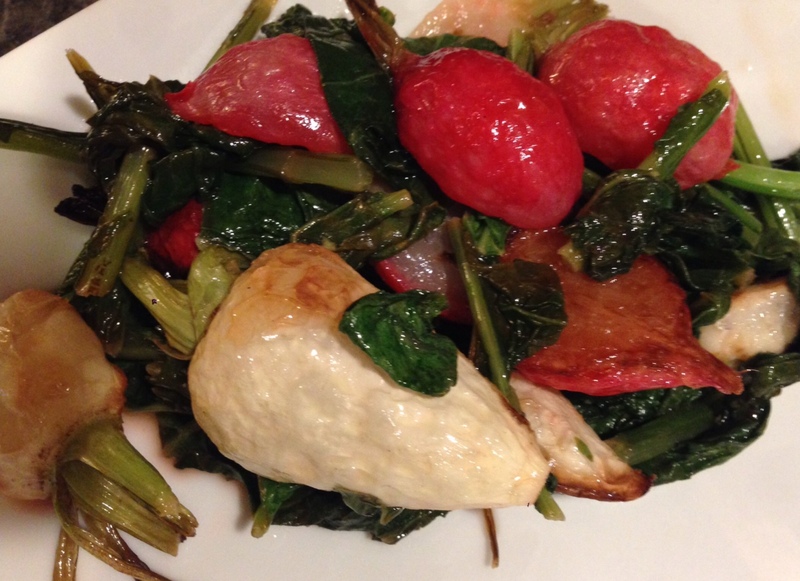 Radish greens can be a little spicy so cooking them and adding lemon can really take the bite out of them. Let me know what you think! Cut off the greens, wash them well, chop roughly and put aside (you’re going to eat them too!). Scrub the radishes well and then cut each one in half. Toss the radishes in a little coconut or olive oil and spread out cut side down on a sheet pan and sprinkle with sea salt. Roast them in a 425 degree oven for 15-18 minutes (depending on size). Towards the end of the cooking process, heat a cast iron skillet over medium heat, melt 1 tbsp butter and when hot, saute the greens just until they wilt and reduce in size. Add the cooked radishes to the pan, melt the 2nd tbsp of butter and squeeze the juice of a whole lemon over them. Add more salt if necessary and eat! This makes two hearty vegetable servings for me and john (because we’re veggie monsters) but if you’re new and timid with cooked radishes, this could be enough for 4! I swear these taste way better than this picture makes them look. 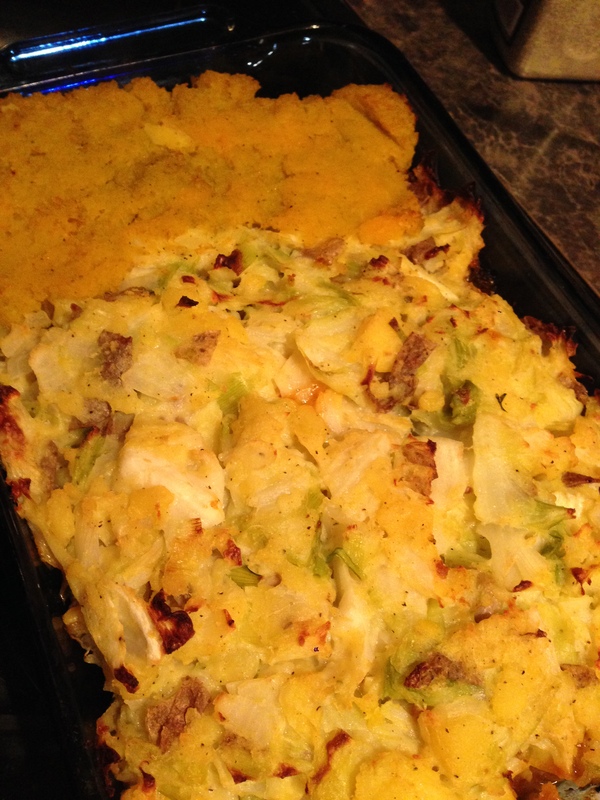 This entry was posted in Gluten Free, Recipes, Tree nut and Peanut free and tagged gluten free, greens, lemon, radishes, roasted radishes, side dishes, tree nut and peanut free, Vegetable on October 9, 2014 by Andrea Quigley Maynard.